Which One Will YOU Choose at Comp-U-Plus? Fat Brain Toys Projects a Winner! As you’d expect, fewer retailers sent emails on Election Day – voters were busy enough at the polls and glued to the news. I suppose there’s nothing wrong with having an Election Day sale, but I don’t see anything special about it either. What’s interesting is none of these campaigns segmented me out as a Canadian. 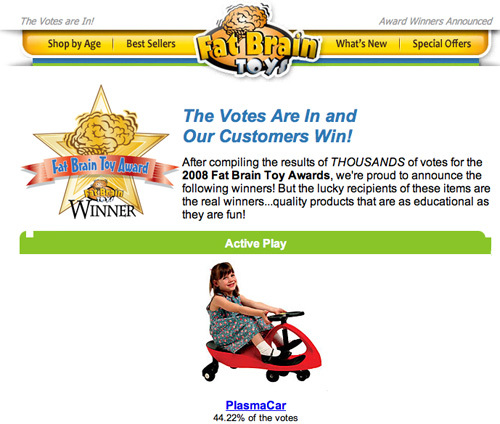 Kudos to Fat Brain Toys for actually holding an election – for the 2008 Fat Brain Toys Award. Delia’s subject line including “You Voted!” sounds like they had a customer vote also, but it just links to the best sellers category. A real vote would have been more fun.